ARE YOU A COACH WHO IS LOOKING TO GET BETTER OR ARE YOU SATISFIED? 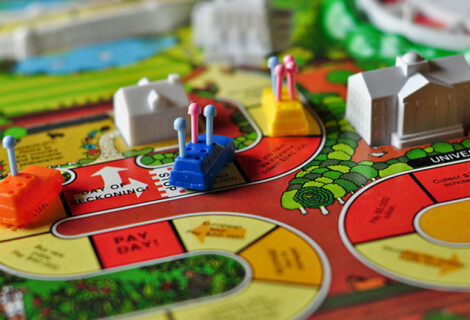 ARE YOU A PARENT WHO IS SPENDING SUBSTANTIAL DOLLARS AND SEEING POOR RESULTS? ARE YOU A BASKETBALL PLAYER WHO IS NOT GETTING BETTER AND WANTS TO TAKE A HUGE LEAP FORWARD THIS SUMMER? If you are satisfied, read no further. If you are eager to get better, read on! Introduction: Similar to Coach John Wooden, I did not become a coaching master until my late 40’s, even though at age 23 my University of Alaska team was the first Nanook team to have a collegiate winning season at 13-3. Similar to Jim Harrick, I also discovered how much more I learned from watching many practices and games after we retired from college coaching. The System: Great coaching is the product of great systems. The Crowell Basketball System is based on 50 years of playing, coaching, and mentoring college players to young dribblers. 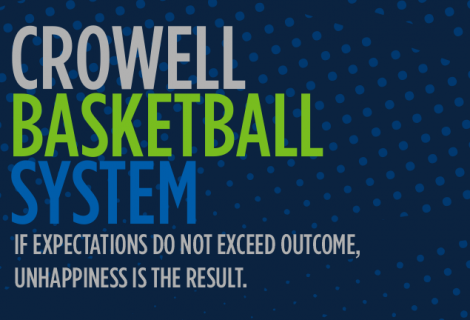 The goal of Crowell teams is to play with great intensity, take care of the ball, do not allow offenses to play in rhythm, take high percentage shots and play with freedom and love of the game. I have learned that Emotional IQ is more important than Skill IQ. Individual Skill IQ is a far superior way to master games-only. I am convinced that summer ball, with little to no individual skill training, actually makes players less effective. Crowell Point to Post (Own the Perimeter and Dominate the Paint) – 5 Days – Includes 40 hours on the court with Individual, Team, Emotional IQ, & Team Skill mastery. 3 great meals, lodging & gear. It is Crowell’s belief that 5-on-5 play is not the best way to improve. It only proves what you can or can’t do! See Crowell’s Basketball Math to prove this point. From an early age the “tallest kid” plays with his back to hoop. The “smallest kid” plays point guard. This camp will teach you how to play both positions and will include minimal classroom time because Crowell believes “doing” is superior to sitting while learning. *Coaches cost to observe and learn: $300 fee (*$100 deduct for each player you bring – up to 3 players). WIAA Clock hours available. E-mail MMaguire@nbccamps.com for more details on these opportunities or for coach observation inquiries. Crowell Intensity Camp – College Prep Camp – 7 focused days – including 56 hours of skills and games. *Cost: $1280 (includes $15 Registration fee) – Compare this to going to four weekend tournaments (2 hours and 41 minutes of playing time on the court) to 7 totally focused days which enhances learning. Coach Crowell believes this is one of the most unique & dynamic training experiences. 100 athletes each year travel from across the USA and many foreign countries to have 56 hours of FUN D’ MENTALS. It is a great opportunity for athletes to learn a quicker game speed, a tougher mindset and compete in game-like situations to climb the camp success ladder. *Coaches cost to observe and learn: $500 fee ($100 deduct for each player you bring – up to 5 players). 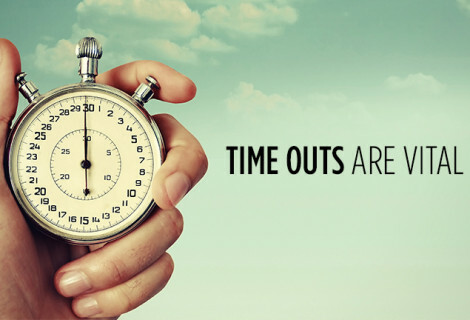 WIAA clock hours available. The Experience – 14 days – The 14-day Ultimate Basketball training features 98 hours of on-court hoops, plus highly effective off-court Emotional IQ and Leadership Skill mastery and games. Crowell encourages you to compare this to the athlete he spoke with who spent $8,000 of travel ball playing 21 hours and 33 minutes. The Experience is a total basketball immersion training. Research shows that total immersion is one of the most effective ways to master skills in language, music, computers, and sports. Sign up for the ultimate basketball experience today! 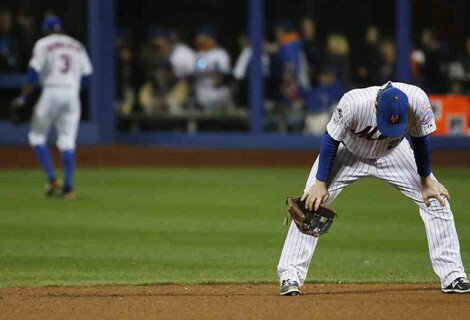 The will to win is not as important as the will to prepare to win. 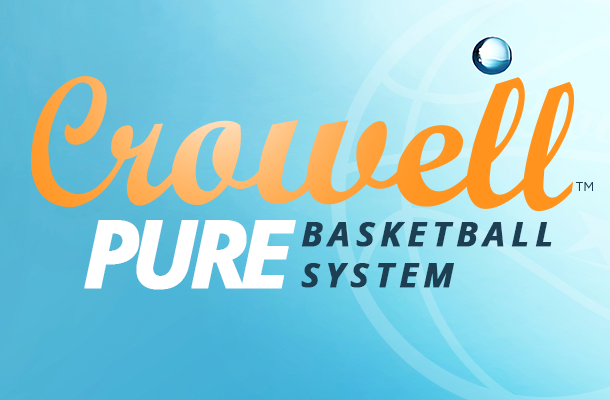 The Crowell Pure Basketball System teaches how to prepare to win!